For more than fifteen years, VFA has focused on bringing our clients fine art prints created by extraordinary artists. Our recent focus has been on three extremely skilled artists who have been producing Fine Art Prints for many years. 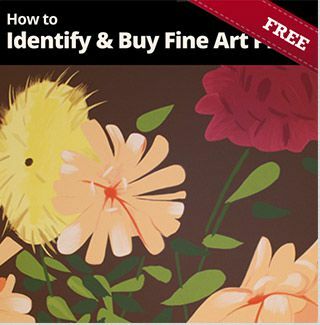 We used Late Summer Flowers the work of Alex Katz, one of our favorite artists, on the cover of our eBook, How to Identify and Buy Fine Art Prints, because Katz’s work is such a fine example of masterful printmaking. Alex Katz is not just a printmaker, he’s also a painter and sculptor. His recent work, Chance, available at VFA, is Katz at his most playful. Katz began making, what he calls cutouts, in 1959. Frustrated by the physical boundaries of the paintings he was working on, Katz cut out the two figures in the painting. He says that Robert Rauschenberg encouraged him to hang on to them, and so he mounted them on plywood. He liked the results and continued to make cutouts. In 1961, playwright Kenneth Koch saw an exhibition of Katz’s cutouts and commissioned him to make props and sets for his one-act satirical play George Washington Crossing the Delaware. The play was an underground success, as was Katz’s work. Katz’s cutouts of George Washington Crossing the Delaware are part of the Smithsonian Collection. A large version of Chance was placed in a London fountain for public viewing before being taken to the Timothy Taylor gallery in Mayfair. Mel Bochner, one of the leading figures of Conceptual art in the 1960s and 1970s, has brought printmaking to a whole new level. Not only is his work compelling, but his techniques are, as well. He has been creating digital images with Plexiglas plate cuts, which are turned into prints, using a high pressure hydraulic press. Bochner’s works are thoughtful, often funny and ironic. His work is currently on display at the British Museum and at the Bowdoin College Museum of Art in Portland. In the complex works, Amazing and Right On (for sale at Vertu), Bochner uses his thesaurus-like themes to explore language, design and art itself. The miraculous thing about Chuck Close is not that he’s 76, paralyzed, and still paints, but that he’s 76, paralyzed and still paints so well. According to a July, 2016 New York Times Magazine interview, Close has been more seclusive, forgetful and physically compromised than ever, but he still works with the fervor of a young artist. His Self-Portrait 2015, available in our gallery at this time, shows an older, scrutinizing self. The woodcut is done in his usual grid, but the image, with white beard and irregular features, appears as if Close is coming to terms with his older identity. Please contact us if you would like information about these or any of the other works in our gallery. Edition is of 70 pieces. This work is Printers Proof VI/VIII. Signed, numbered and dated in pencil.